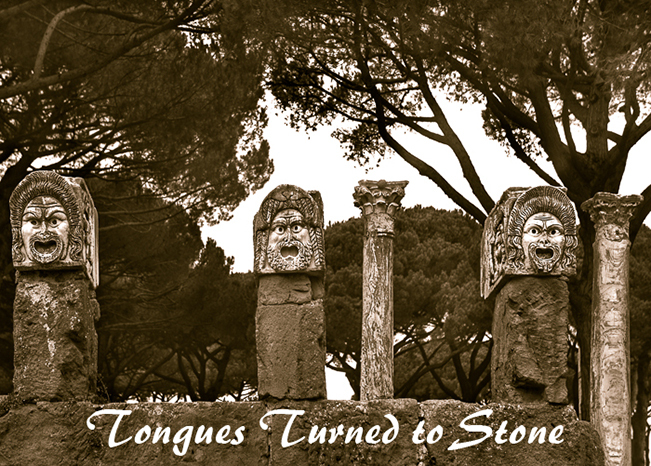 Tongues turned to Stone is a portfolio of photogravure prints of images of ancient theatres, which is itself an section of a body of work focusing on that part of human history that is "written" in stone. The stone may be naturally occurring or man-made (buildings, bridges, statuary, stairways, inscriptions). The theatres are set in environments that are themselves subject to metaphorical interpretation. Images and their titles are not intended to be documentary but represent lanscapes populated by a "forest of symbols." The overriding thrust here is a nature/culture interaction. The ancient Tragic Theatre is grounded in Greek myths, which may be seen as a form of sacred scripture and a foundation of Western culture. In the view of C.G. Jung, the Greek myths are not just stories about the distant past, but the basic foundation of the unconscious psyche. At the archetypal level, they represent universal patterns of the experience of mankind. There is also an historical element that interacts with the archetypal dimension resulting in the classical Greek tragedies. I have composed the images to emphasize the elements of ancient Greek theatres: the fan-shaped auditorium built into a natural hillside, the entrances, the circular orchestra, and the skene where the actors chould change masks without being seen. Obviously, the theatre remnants are situated in a particular place and time (5th century Greece). The theatre ruin stands for history as a process of decay, neglect, and loss. Some of them are being devoured by nature. While I have largely excluded human figures, humanity is the unseen force (Nature) that permeates the sites. I hope the viewer feels the palpable presence of the absent spectators as well as the spirits of Aeschylus, Sophocles, and Euripides. The persons who are actually present represent resurrection. These images are from digital captures that are enlarged to positives, exposed to polymer photogravure platesm and printed with ah etching press on Gampi shi, a handmade Japanese paper. This process yields a delicate, warm image that seems to belong to the past.